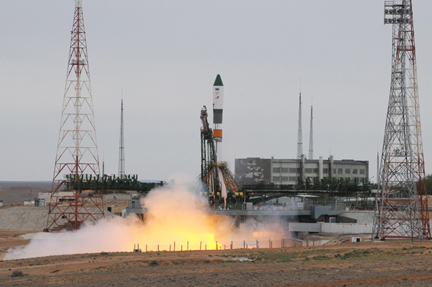 An unmanned Russian Progress supply ship, running two days late because of high winds, was successfully launched from the Baikonur Cosmodrome in Kazakhstan Friday. If all goes well, the craft will carry out a robotic rendezvous and docking at the aft port of the station's Zvezda command module around 7:58 a.m. EDT Sunday. The Progress and its Soyuz launcher blasted off at 6:22 a.m. Friday, rocketing away through an overcast sky. Nine minutes later, the spacecraft, designated Progress M-07M by the Russians, reached orbit and its solar arrays and navigation antennas deployed as planned. The 39th station-bound Progress is loaded with 1,918 pounds of propellant, 2,645 pounds of equipment and supplies for the station's crew, 110 pounds of oxygen and 375 pounds of water.